The ISARA arrived in a lovely box with a handle, which make it really easy to store and transport. 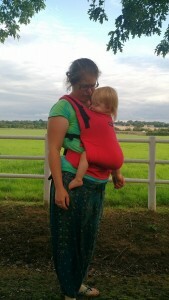 The carrier I have received for review is a wrap conversion (there are a variety of options on their website with prices starting from the equivalent of about £63), and the woven wrap fabric is lovely and soft and flexible, so it forms a lovely snug fit around Reu and I. 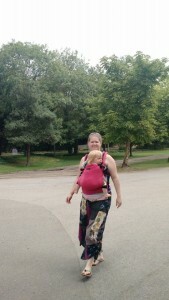 One of the first things I noticed was how generously padded the shoulder straps are and that the padded area is longer than many other buckled carriers I’ve seen and used. The shoulder straps can be used either straight down with the chest strap, or crossed over, depending on what you find most comfortable. The waist band is also well padded and is quite wide, with one continuous padded section which on me (UK size 14) comes approximately two thirds of the way around me. Someone a bit smaller could have a padded waist all the way round. 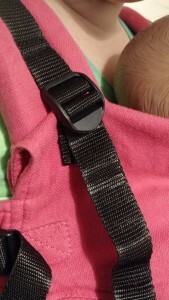 The buckles are all sturdy, with elastic safety loops on the shoulder strap buckles, and there are elastic loops at the end of the webbing to neaten up trailing ends, which is a nice extra touch which you don’t get with all buckled carriers. 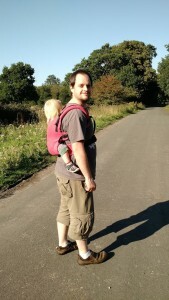 On further inspection, I found all the lovely features that make this carrier so adjustable. 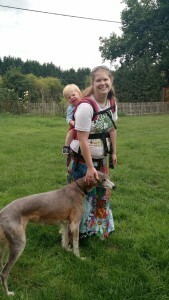 Having been created by a babywearing consultant you can tell that first hand babywearing experience has gone into the design. 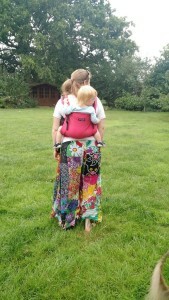 The panel size can be adjusted both width and height wise, allowing you to tailor the carrier for your child’s size to carry them in the desired ‘M’ position. Where the panel attaches to the waist band there are hidden velcro strips which allow you to decrease the width of the panel and secure it in place. This way you can provide knee to knee support for a range of different aged children. ISARA state the carrier can be used from around 10 months and 8kg, although I easily cinched the waist small enough for a 3 month sized demo doll. 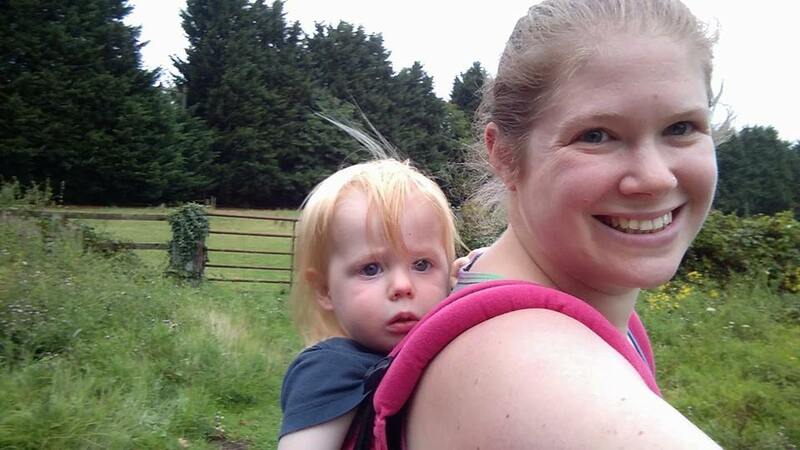 And with the panel at it’s full width, 19 month old Reu still has space to grow so I’m sure this carrier would provide several years worth of use to a family, especially one with differently aged children to carry. I measured the panel width at 8 inches at the smallest and 17 inches at the widest, showing just how versatile this carrier can be. The height of the panel can also be adjusted using the clips at the top of the panel, with a variance of about 3 inches, so you can make it smaller for smaller children or if your older children want to have their arms out. The panel also has lovely seat darts which make it really easy to get a good seat and get the child into a comfortable position to be carried in. I have found the ISARA really comfortable to use. 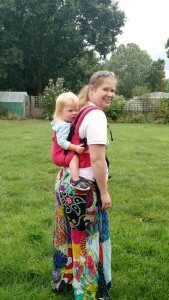 The wide padded waist band fits snuggly around me, and thanks to the lovely seat darts on the main panel, the waist band wasn’t pulled away from me as I have experienced on some other carriers, so there was no digging in of the webbing or buckles with ISARA. 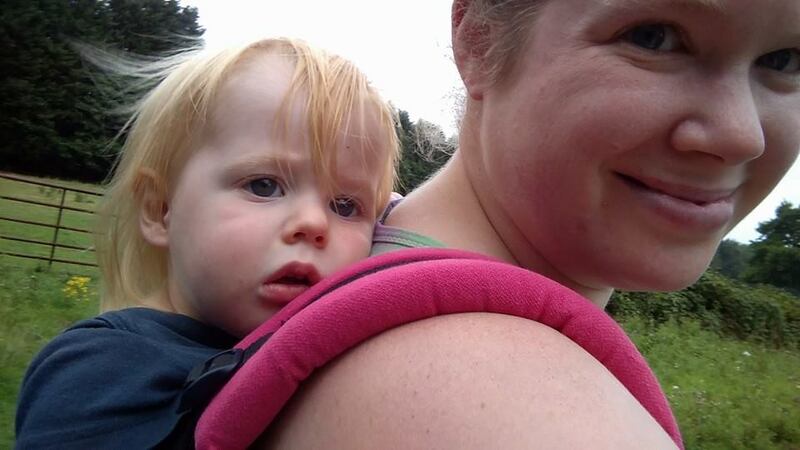 The seat darts make a lovely comfortable seat really easily, and Reu has enjoyed all our testing walks and sessions. At 19 months old, Reu still had some space to grow with the fully extended panel, and I also tried it out with Dory the (scary looking!) demo doll. Dory is 3 months old sized and with the panel at its smallest size, fitted really well. 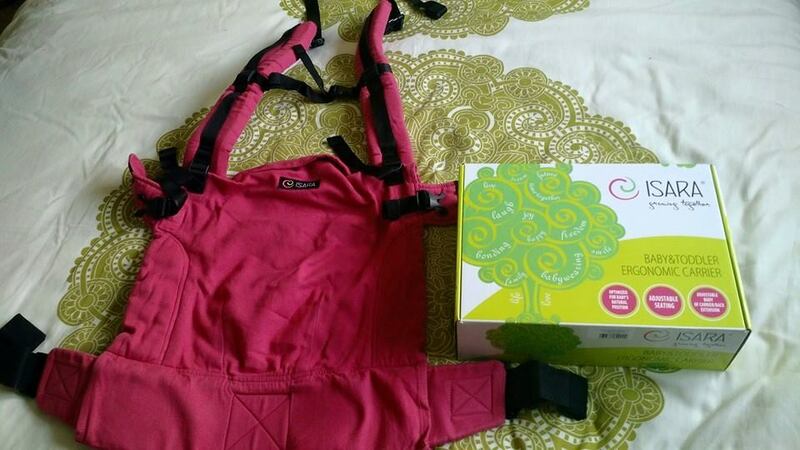 I tried the shoulder straps both straight down with the chest strap and also crossed over, and for me I preferred the straps crossed but this really is a personal preference and both were comfortable. 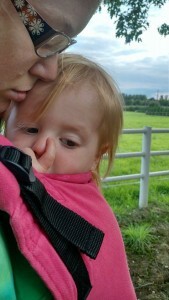 The generous shoulder strap padding was lovely and there was no digging or pulling at all. 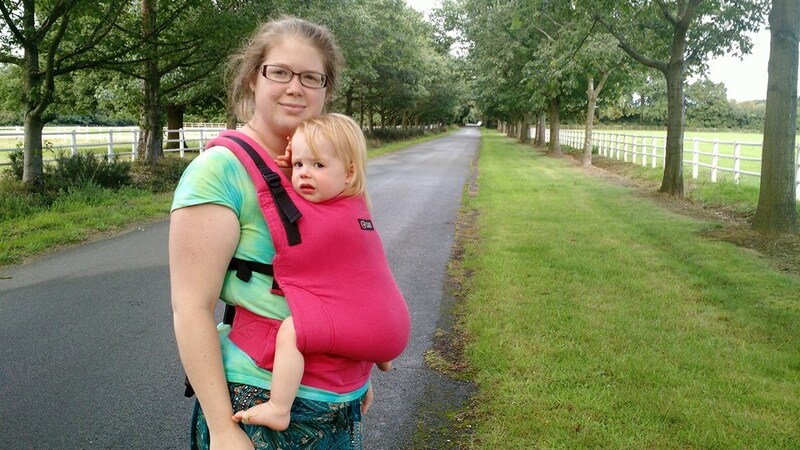 The wrap fabric molded itself round Reu and I in a lovely snug carry, and it was easy to adjust the tightness of the straps to our individual needs. 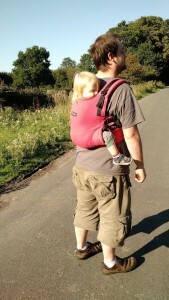 Reu and I also tested the ISARA in back carries on several occasions and again it spread the weight really easily and was very comfortable to use. 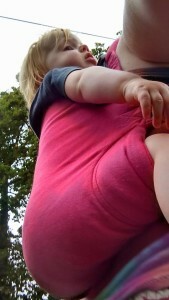 The carrier wrapped around us really nicely again and we played horsey (I pretend to be a horse while carrying Reu), while feeling nice and secure. 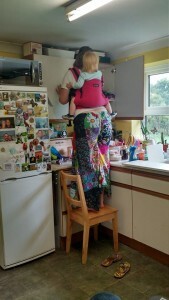 I even popped Reu on my back while I was climbing on chairs to clean out the kitchen cupboards.The padding on the waistband and shoulder straps were again, very comfortable, with no pulling or digging. 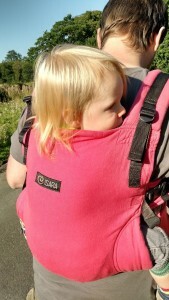 Overall, we’ve really enjoyed using the ISARA and I’m very impressed with the adjustability features, meaning it really can grow with your child, or be used for children of varying ages. 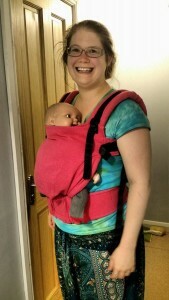 The wrap conversion was lovely to use and of the buckled carriers I’ve tried so far, it’s the closest to using a woven wrap for comfort and the way it moulds around yours and your child’s body. 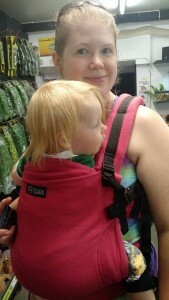 The only thing that ISARA doesn’t have that most buckled carriers do have is a sleep hood, and although this didn’t bother us at all, it’s worth mentioning as if you’re used to one you may miss it. 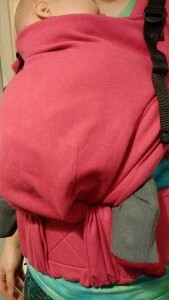 I mostly wrap so am used to not having a sleep hood so in a way it makes sense that their wrap conversion doesn’t have one. 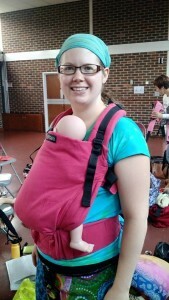 This carrier would also be a great addition to a sling library due to its versatility for different ages. 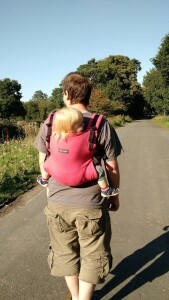 My husband aslo had a go with it and also found it comfortable and commented it was more comfortable than the other buckled carriers he has tried.